The doctor, we are taught, takes illness away, subconsciously we know, of course, he might take our appendix away, but the illness he suppresses. However, that is quite correct, everybody says so, and everybody is invariably right. Until one day the doctor fails to suppress whatever is ailing us, and we accept, smiling with incredulity but desperately anxious to be rid of our complaint, the advice of Like cures Like. Success begets doubt – is there something in it, after all? We study the principle, become convinced, converted and enthusiastic. The history of Homoeopathy is abounding with such instances. 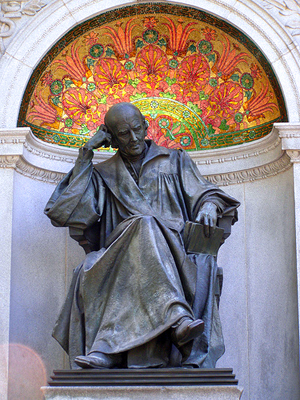 Hahnemann was born in the early hours of Friday, the 11th April, 1755 and named Christian Friderich Samuel Hahnemann. Hahnemann in his autobiography wrote I was born on April 10th, 1755. Description about his life times, his works, his writings. · School days – First in public school up to 16th year. · Then in private school up to 20th year. · Left school in 1775, after presenting the Thesis upon the “Wonderful construction of Human Hand’’ written in Latin. Admitted to University of Leipsic. Came for his medical study in the spring, met Dr. Von Quarin in the hospital of brothers of charity. Here he acquired extensive knowledge in numismatics, ancient literatures, occult sciences & become master in Philogy. On 10th August 1779, submitted his Thesis on “A consideration of the Etiology and Therapeutics of Spasmodic Affections” and got his M.D. Started his 1st medical practice. Attended regularly the lab of Haseler to gain practical knowledge in Pharmacy & Botany. Expressed his dissatisfaction on the prevailing system of treatment through a letter to Hufeland. Translated Demachy’s art of, manufacturing vinegar and detection of the purity and adulteration of drugs. Introduced famous Hahnemann’s wine test instead of prevailing Writenberg wine test. Went on proving Cinchona on himself and on others. In 1792 wrote the 1st part of “Friend of health”. In 1792 went to Georgenthal & treated the insanity of Klockenbring. Here he continued his literary work, in the 2nd part of the “Fried of health” & 1st part of the “Pharmaceutical lexicon”. Cured milk crust by Hepar sulph & wrote an article “On crusta lactea” published in 1795. Completed the “Pharmaceutical lexicon” & wrote the 2nd part of “Friend of health”. In 1796 he 1st communicated to the world by means of public print his new discovery to medicine it was published in Hufeland’s journal Vol.II. Part – 3&4 under the title of “Essay on a new principle for ascertaining the curative powers of drugs”. In 1799 proved the efficacy of Belladonna as a prophylactic against epidemic Scarlet fever. He was engaged in writing books like “Coffee & its effects”, “Aesculapius in the Balance”, “Medicine of experience”, “Fragmenta de viribus Medicamentorum positivis sive in sano corpore humano obsevatis”. 1808 - Published his letter to Hufeland “Letter to a physician of high standing on reform in medicine”. 1810 - The great book “Organon of Rational healing”. 1806 - Translated the Materia Medica of Albert Von Haller from Latin which was the last book he translated. 1811 - Went to Leipsic Resided in Burgstrasse in a house known as the “Gold enen Fahne”. 1812 - Presented a Latin thesis “A Medical historical Dissertation on the Helleborism of the ancients” & then was allowed to teach homoeopathy officially. 1813 - Published an article “The spirit of homoeopathic healing law” which was the first article on homoeopathy published in United state. 1813 - Is the year of triumph, successfully cured the Typhus fever by Rhustox & Bryonia. 1814 - Published an article “Treatment of Typhus or hospital fever at present prevailing”. 1816 - Essay on the improper treatment of Veneral diseases. 1819 - Second edition of Organon of medicine. Continued his proving and worked upon his Materia Medica Pura. · 1811- 1st volume published. · 1816-1817 – 2nd & 3rd volume published. · 1818 – 4th volume published. · 1819 – 5th volume published. · 1821 – 6th volume published. 1827- First disclosed the Theory of Miasm to two of his pupils. 1831- Published a pamphlet on “Cure & prevention of Asiatica Cholera”. 1830 - Cured Dr. Julius Aegidi and proved the truth of his new doctrine regarding the origin and cure of chronic disease. 1824 - 3rd edition of Organon published. 1829 - 4th edition of Organon published. 1833 - 5th edition of Organon published. 1822 - 1st volume of Materia Medica Pura published (2nd edition). 1824 - 2nd volume of Materia Medica Pura (2nd edition). 1825 - 3rd & 4th volume of Materia Medica Pura (2nd edition). 1826 - 5th volume of Materia Medica Pura (2nd edition). 1827 - 6th volume of Materia Medica Pura (2nd edition). 1830 - 1st volume of Materia Medica Pura (3rd edition). 1833 - 2nd volume of Materia Medica Pura (3rd edition). 1828 - Volume – I, II& III of chronic disease (1st edition). 1830 - Volume – IV of chronic disease (1st edition). 1835 - 2nd edition of volume – I & II of chronic disease. Revised and prepared the Manuscript of 6th edition Organon. Soon after his 88th Birthday he became sick which continued for 6 weeks. On 2nd July 1843 – at 5 O’clock morning on Sunday he breathed his last. It was Boenninghausen who first evaluated remedies in relation to the individual symptoms, and it was he who first introduced various other methods of relationship of any given remedy to the individual case. Boenninghausen’s analytical mind evolved the doctrine of concomitants. He was the first to recognize the value and necessity of some form of index to the rapidly growing list of remedies being developed and proven by Hahnemann and his disciples. He wrote “Boericke’s Materia Medica” in 1901. He introduced Hecla Lava into the Boerick’s Materia Medica. He translated “Boenninghausen’s Characteristics and Repertory” into the english language in 1905.In 1915 he wrote a book named “Synoptic Key and Repertory”. In 1931 he developed the Boger general analysis and Card Repertory. Close was the founder of Brooklyn Homoeopathic Union, a group devoted to the study of the principles of pure Hahnemannian homoeopathy. In 1905, Close was elected as the President of the international Hahnemannian Association. He was professor of Homoeopathic Philosophy at NewYork Homoeopahic Medical College from 1909 to 1913. Initially his lectures were published in the homoeopathic recorder. Later these lectures were complied and published in form of a book, The Genius of Homoeopathy. He wrote Essentials of Homoeopathic Materia Medica, Essentials of Homoeopathic Therapeutics, and Practical Homoeopathic Therapeutics. He also worked together with William Boericke on the Twelve tissue salts. He was the founder of homoeopathic League in 1887 which included homoeopathic physicians and the laymen sympathizer of homoeopathy to educate the public about the new system and to remove the misconception that Hahnemann’s method was only a quackery. Dudgeon translated lots of homoeopathic writings from German to English and wrote many himself. He was editor of the North American Homoeopathic journal from 1851 to 1853; The Homoeopathic News from 1854 to 1856; The American Homoeopathic Materia Medica from 1867 to 1871. Dr. Hering is also famous for the Law of Direction of cure, which is as follows: Cure takes place from above downward; from within outward; from a more important organ to a less important organ; symptoms disappear in the reverse order of their appearance the first to appear being the last to go. In 1867 he wrote “Manual of Pharmacodynamics” and “Manual of Therapeutics”. He worked as an officer for the British homoeopathic society. He was the editor of the British journal of homoeopathy. He also edited the six volume Cyclopedia of drug pathogenesis and worked with T.F. Allen on his 10 volume Encyclopedia. Dr. Kent introduced the doctrine of ‘Series in Degrees’ in the treatment of chronic diseases. He discovered that “just as there are octaves of musical tones so there are octaves in the simple substance through which severally it is possible to correspond with the various planes of the interior organism of the animal cells”. These planes correspond to similar remedy in 30th, 200th, 1M, 10M, 50M, CM, DM, and MM potencies. He discovered the “Law of Vital Action and Reaction”. The law is “A medicine is too high to cure so long as it is capable of aggravating the symptoms belonging to the sickness in the first hours in acute and in the first few days of a chronic sickness”. He also found that a homoeopathic aggravation is essential from the application of the similimum in chronic cases. He discovered the language of Reaction and had shown the direction of the course of treatment immediately following the first dose and how the multiple reactions following this step should be interpreted and the patient led scientifically towards complete recovery. He evaluates the symptoms in a nice manner imposing greatest values to the mental symptoms with their further classifications. · 1897 – He published Repertory of Homoeopathic Materia Medica. · 1900 – He published Homoeopathic Philosophy. · 1905 – Lectures on Homoeopathic Materia Medica was published. · Dr. Kent proved many new medicines, which he was described in his books, ‘New remedies, clinical cases, Lesser writing, Aphorisms and precepts’. · ‘What the Doctors Need to know’ – a very popular writing of Dr. Kent. · Haehl, Richard. Samuel Hahnemann, his life and work, Volume-I, B. Jain publishers New Delhi. · Kent, James Tyler. 1954 (republished 1994). Lectures on Homœopathic Philosophy. 5th edition. B Jain, New Delhi. · Bradford, T.L. The life & letters of Samuel Hahnemann, B Jain, New Delhi. · Brief History of the Founder & Discovery of the system of Homoeopathy, B Jain, New Delhi. · Knerr, Calvin, B. Life of Hering, B Jain, New Delhi. · Pioneers of homoeopathy, B Jain, New Delhi.